Like a phoenix from the ashes, Princecraft’s Sport 164 is back in 2017! The Sport 164, with loads of new features that will make it more popular than ever, is the ideal boat for families who want to spend their vacations both fishing and enjoying water sports. 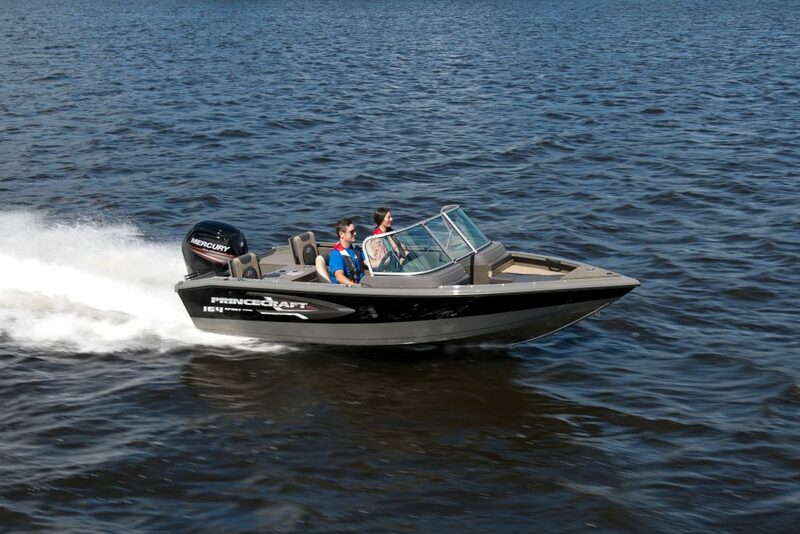 The 16′-6″ Sport 164 has a 90″ wide hull made of the famous, super strong H-36 alloy. This wider-than-usual configuration provides superior stability, more onboard space, and most importantly, the possibility of using a more powerful motor for water sports. This allows you to go faster, but more safely, and provides better fuel economy at cruising speeds. The new Sport 164 has a smaller motor well, which increases floor space for fishing and waterskiing equipment and makes it easier to get around. The addition of an optional, easy-to-remove ski tow bar in the stern and standard boarding ladder doubles your water skiing fun. To complete the package, the Sport 164 has a double windshield that’s tinted and curved, providing better protection for driver and passengers alike. With large bow and stern platforms, a 26″/39 litres aerated SportFlo™ livewell in the front, and a 7′ storage space for fishing rods, the Sport 164 is also designed for anglers. Princecraft made all these improvements to ensure better weight distribution for fastertake offs with medium-size motors and to optimize space. The Sport 164 can accommodate 60 to 115 horsepower Mercury 4T motors and is a cinch to steer thanks to the No-Feedback™ steering system. 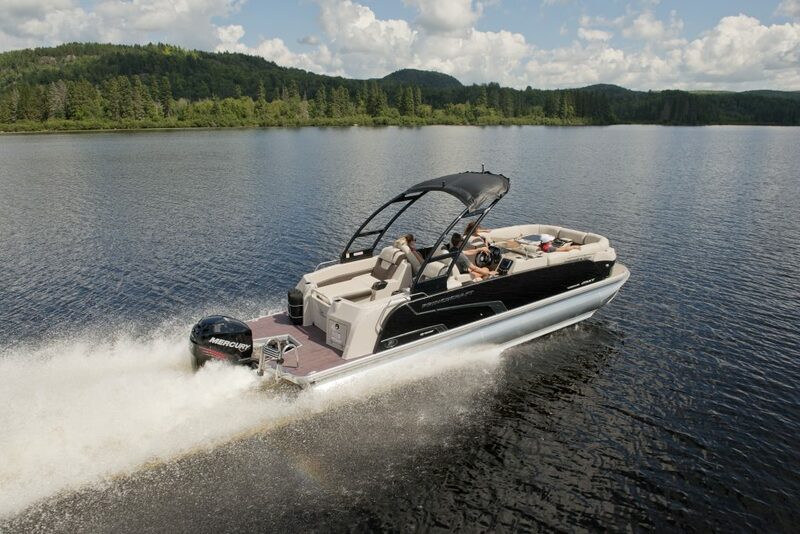 If you’re looking for something new, try the better-than-ever Princecraft Sport 164. Princecraft Vogue Series pontoons will be turning even more heads in 2017 thanks to their new distinctive, modern look. combinations. Owners will be able to choose a unique selection of colors for the new, ultra-comfy seats and the outside of the boat. The interior look will no longer depend on the color of the exterior—instead, the customer will decide. The wide variety of attractive, contemporary colors will allow customers to opt for a sleek and elegant “classic” look or a newer, flashier appearance. integrated media center with color screen. Those who want more can opt for the new high-performance audio system with 6″ Raymarine touch screen. Customers will also be able to add waterproof speakers to the wakeboard tower for the ultimate sound experience (Vogue 25 XT, Vogue 25 SE, Vogue 27 SE, and Vogue 29 SE). In response to customer demand, Princecraft will be offering a wakeboard package as an option on the Vogue 25 SE, which has been redesigned for the purpose. And last but not least, all Vogue models will be factory equipped with a new stainless steel boarding ladder that fully retracts for less splashing and friction when the boat’s on the move. For a pontoon with your own original stamp, check out the Princecraft Vogue Series. With the Xpedition, seasoned anglers have everything they could wish for! Perfection may not be possible, but Princecraft has come pretty close with the Xpedition, an angler’s dream come true. For next season, the renowned Canadian aluminum boat builder has transformed this model into a more powerful, full-featured fishing machine. Those who love to fish will really get an eyeful when they check out this new model. With the Xpedition, anglers can customize their own boat. First they can choose between two lengths, 17′-11″ (Xpedition 170) and 20′-0″ (Xpedition 200), then select one of three configurations with either a side console (SC), twin consoles (DC), or twin consoles and full-width windshield (WS). The boat also comes in three colours: red, black, and magnetic gray. This model has everything it takes to be a superb fishing boat. It still has an ultra-strong H-36 aluminum structure, but the inside has been completely redesigned to make it even more comfortable and efficient for anglers. This means wider consoles that can hold all the instruments anglers need, plus an optional integrated 12″ sonar. They even add a bracket for a second sonar of the same size. Under the console, there’s now a recessed pan for the gas pedal and a similar recessed pan on the fore platform for the trolling motor pedal. These two additions make it easier to drive in all fishing situations and enhance driver comfort, in both standing and sitting positions. For anglers who want more space, Princecraft has lengthened the fore and aft platforms to make it easier to get around and cast without getting in anybody’s way. And because the platforms are bigger, the storage space is too. The central storage space for rods now has lighting and an L-shaped cover, making the rods easier to see and take out. The aft storage space can hold a second battery to power the many electric and electronic devices modern anglers need. Princecraft has also included a system between the two fishing platforms to quickly drain water from the cockpit to the bilge pump, for greater comfort on rainy days. On the subject of humidity, Princecraft has innovated again, with new vents to keep air circulating in the compartments to eliminate dampness and prevent condensation to make sure your equipment stays dry. A ventilation system in the fore platform storage compartment is available as an option. 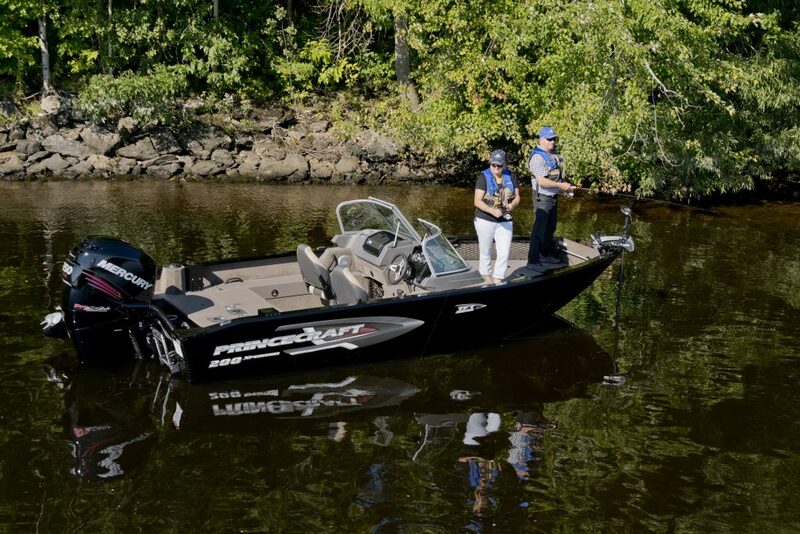 Princecraft designs its boats for anglers but also for fish! The Xpedition has two large livewells (stern: 44″/77 litres – bow: 30″/64 litres) equipped with the famous ProFlo™ Plus system, the absolute best way to keep fish alive during a tournament or for the evening meal. One look will convince you that the new Xpedition model is designed to give each fishing fan the boat of their dreams.